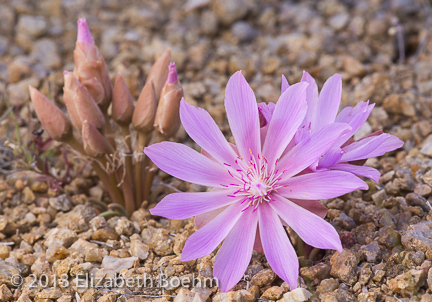 The Bitterroot (Lewisia rediviva) is very conspicuous when in bloom. The bright pink blossom shows off on bare, gravelly slopes here in Sublette County, WY. It is hard to not stop and enjoy each blossom as it is stunning! The plant starts as green, succulent leaves which appear shortly after snow melt and are barely noticed as they hug the ground. As the leaves die back the edible bulb pushes up a beautiful flower which may look as though it never had leaves. The flower was named after Meriwether Lewis who first collected the plant in the Bitterroot Valley of Montana. The Shoshone Indians used the flower as a food staple and collected the root in the spring prior to blossoming thus gaining the full nutrition of the bulb. Rediviva (the species name) means brought to life which refers to the ability of the root after being dried to rejuvenate. This beautiful wildflower blooms in June in Western Wyoming and is a sight to behold!